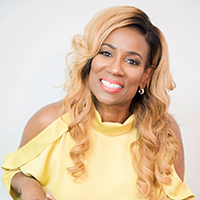 Terri Crook is in constant demand to speak and host audiences nationwide, ranging from training events, industry associations, college campus tours, Fortune 500 companies and prestigious conferences, where she shares candid stories from her career, strategies and solutions for finding success. Her engaging personality and interactive style have captivated intimate audiences of 50-100 and fascinated large crowds of over 1000. Terri is energizing, engaging, and insightful—always delivering actionable advice and ideas to move people into their calling zone. As a motivational speaker, Terri lights up the room with power and energy by encouraging people to “stay in the game”. Her Keynote speech “It’s Only Half Time”, encourages people to “Live Out Loud!” by helping them to redesign their playbook to move out of their comfort zone into their calling zone. Her message in gaining “Peace” from financial tackles is one of her most sought-after messages as a speaker. She not only shares her personal story on how she recovered from a tremendous financial fall, but outlines steps taken and how one can do the same. 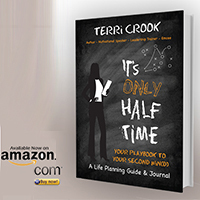 Terri Crook has authored a book entitled It’s Only Half Time Your Play Book to Your Second Win(d), a Life Planning Guide and Journal. She provides an insightful and transparent review of the first half of her life. Her personal playbook reveals how she mismanaged money, her time, career and relationships. “Play by Play” she gives examples of how you can become the Most Valuable Player (MVP) through her Personal Development Plan and Journal. It’s a game changer towards getting your second-win(d) in life. 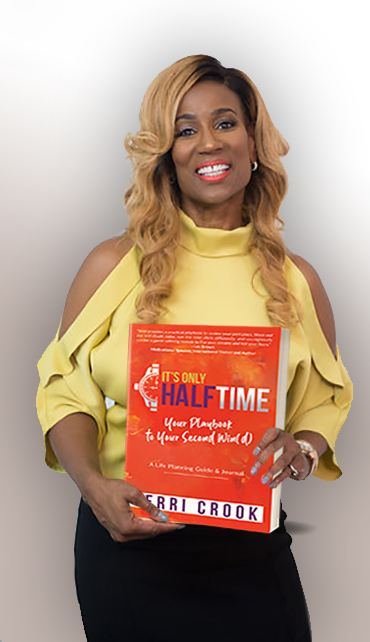 Terri’s “Playbook” will help you move out of your comfort zone into your calling zone, believing it’s only half time and you’re still in the game!. Living Out Loud: An impactful process of releasing your fears to get your second win(d). It’s only half time and you’re still in the game – an 8-step process in redesigning your playbook to move out of your comfort zone into your calling zone. 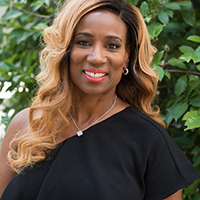 As a former government industry recruiter, Terri has created a Career Fair Boot Camp to help students put their best foot forward to gain an internship, cooperative education position or employment opportunity. Her 30 second elevator pitch process and brochure of do’s and don’ts, makes this workshop rewarding and FUN!